Combine raspberries, sugar and jam and pour into a blender. Puree mixture until smooth and pour coulis through a fine mesh sieve and discard seeds. (Can be made two days in advance.) Store in small bowl in refrigerator. Combine egg white and water in medium bowl, whisking until foamy. Add pecans and toss to coat. In a separate bowl, combine sugar, salt, cinnamon, cayenne pepper and brown sugar. Transfer pecans to the bowl with the dry ingredients and toss to coat. Pour onto a baking sheet, separating to eliminate clumps and bake at 325 degrees for 20 minutes stirring halfway through. Remove from the oven and stir to eliminate clumping. Let cool completely. (Can be made two days in advance.) Store in an air tight container at room temperature. In a large bowl combine cream cheese and brie and mix with a hand held mixer until well incorporated. Spoon into phyllo cups and bake at 350 degrees for 10-12 minutes, or until warmed through. Remove from oven and let cool slightly. 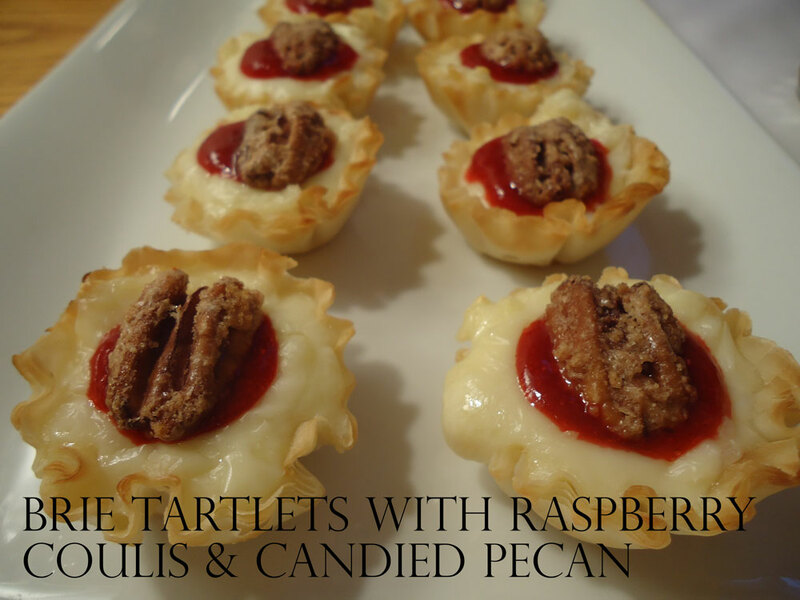 Place a ¼ teaspoon of raspberry coulis in the center of each tartlet and top with candied pecan.